Jackson Falls near milepost 405 in Tennessee. 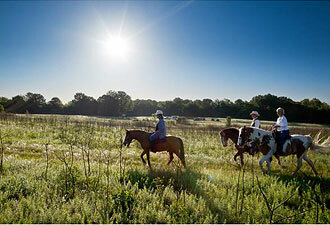 The Natchez Trace National Scenic Trail is one of four parkway trails available for horseback riding. 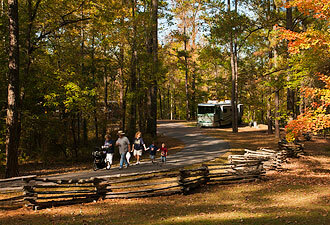 At 444 miles, the Natchez Trace Parkway is one of the longest national parks in the world. This National Scenic Byway and All-American Road commemorates some of the most profound events in our nation’s history. It traverses Tennessee, Alabama, and Mississippi allowing you to explore historic, scenic and music trails; Civil War trails; National Heritage Area sites; and to enjoy an abundance of recreational activities. People have traveled the trace for thousands of years. Journey through history by walking in the footsteps of American heroes like General Andrew Jackson whose troops marched along the Trace during the War of 1812. Visit the death and burial site of renowned explorer Meriwether Lewis. Learn about centuries of Native American Indian history, hear the stories of the Kaintuck Boatmen, and how, in the 1800s, the Trace was one of the busiest commerce routes on the American frontier. Cultural sites such as Emerald Mound (milepost 10.3) or the Chickasaw Village Site (milepost 261.8) tell the story of early residents. Sections of the Old Trace, located at various locations along the parkway, give you an opportunity to walk on the original trace, like thousands of travelers before you. Add the culture of Nashville to the north, and Natchez and New Orleans to the south, and you have an endless number places to have fun and learn. 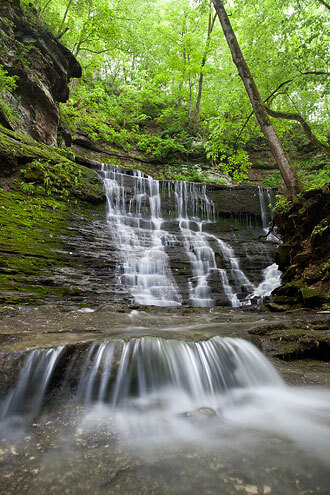 The Natchez Trace Parkway provides a chance to enjoy the scenic vistas at a relaxed pace while driving. Travelling the parkway, by car or bike, provides a unique experience with each season. The redbuds and dogwoods bloom in the spring, filling the roadside with pink, purple, and white flowers. Each fall, the maples, hickories, oaks, and other hardwoods change from green to vibrant reds, oranges, yellows, and browns to fill much of the parkway with brilliant colors around each turn. The Natchez Trace Parkway provides a corridor for wildlife to move from neighboring national forests, state parks, and other public lands. Stay alert when traveling on the parkway, because you may see wildlife, especially around dawn and dusk. Deer and turkey are quite common, but a lucky traveler may also see a coyote, fox, armadillo, or even a black bear. If you are interested in seeing wildlife at a slower pace, a short walk on one of 52 nature trails gets you off the roadway to see things that many visitors miss. In late summer, ruby-throated hummingbirds migrate close to the Rock Spring Trail (milepost 330.2). If you want to see an alligator, try the Cypress Swamp (milepost 122.0) for a chance to see these reptiles in their natural habitat. Neighboring lakes and rivers provide fishing and boating opportunities, and horseback riding is allowed on designated horse trails in conjunction with the Natchez Trace National Scenic Trail. Enjoy special events throughout the year at the visitor center in Tupelo, Mississippi. Whether you travel the Natchez Trace Parkway from Natchez to Nashville, or for just a few miles in between, there are countless ways to create your own adventure.